The following article was originally written by Qian Ling Chow and published in The Smart Local on 02 September 2016. You can find the original post here. While I don’t hug my plush toys to sleep any more, I have too many childhood obsessions I refuse to throw away. But hey mum, I’m not a hoarder – let’s just call it being sentimental. Trying to master the art of living through an organised mess isn’t necessarily a bad thing. But when things do go missing, you can’t help but think that perhaps it’s really time to get your life together. BEAM differentiates themselves from other storage companies by offering the first same-day pickup service. You know it’s dedication when they do same-day pick ups without even charging! The current industry buffer time needed for a last minute pick up lies anytime within 48-hours. If that’s not bad enough, they sometimes charge extra if immediate action is needed. BEAM, however, not only shortens this waiting time, but also does a pick up even with only 4 hours of notice. This is also why even though they’ve only started running two months ago, many of their customers are converts from other storage companies. b. And always for free! 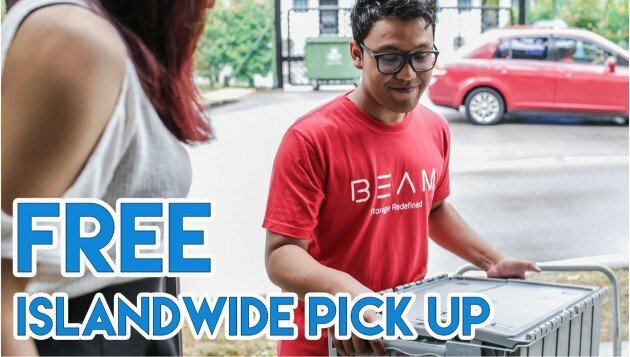 From used guitars to old office documents, BEAM hops right to your doorstep, picks up your items, catalogs them, and stores them till you need them back. Unlike conventional storage companies, BEAM doesn’t drop off a bulky box and expect you to drive your box of treasures back to their warehouse. Instead, their team runs a highly efficient islandwide pick-up service from 8 am to 8pm daily. Available in 2 hour-intervals, you can specify a time slot convenient for you with the best part: it’s ALWAYS free! Tightly taped to keep cushioning in place. Fully equipped with bubblewrap and storage boxes, their team of storage concierges is ready to tackle any tough job. Big or small, jagged or odd-shaped – your items are in good hands as each item is being thoroughly cushioned by thick bubble wrap and transported carefully. Labeled with a QR code. One of the reasons for their efficiency is how their state-of-the-art barcoding system allows them to locate products easily. This saves time and allows them to quickly isolate and locate specific items in their warehouse, sending it back to you without any delays. Think virtual (storage) closet. The beauty of BEAM’s itemisation brings you the convenience of viewing all your stored items on the app itself – anytime, anywhere. Have it your way as you fully customise how you want your virtual BEAM closet to look like. You’ll no longer have to painstakingly recall what in the world you deposited at the warehouse 6 months ago, without having to retrieve the entire storage box for just one item. That’s now an issue of the past. Inspired by the steep prices and impracticality of conventional box storages, the co-founders of BEAM – Jason P, Jason G, and Kash P – decided that it was time for a storage space revolution. Having previously spent a bomb on storage services when they moved to Singapore, they wanted to offer storage that’s cheap, efficient, and easily retrievable. Even though warehouse and box storage systems have been in Singapore for years, there is nothing like BEAM that allows you to only pay for what you use. Bid goodbye to paying for large storage spaces when only half of the room is filled. For items you can hand carry up a plane, storage will cost S$0.90 per month. Larger ones which you have to check-in onto a plane like golf bags and suitcases will cost $5 a month. Store private boxes if you require privacy. This option assures that your box will not be opened or itemized and it’s perfectly suited for storing official paper documents, rare toy collections, or prized childhood possessions. Small boxes (less than 115cm L+W+H) store for $4 a month and large ones (over 115cm L+W+H) will cost $8 per month. When the BEAM team is done with their magic, all you need to do is to sign your item(s) off and they’re good to go. Once checked into at their 6000-sq feet air conditioned warehouse, each storage item is photographed and uploaded onto their system so that your virtual closet is always up to date. Every item they collect is insured up to S$100 per box and up to S$1,000 total in their high security facility completed with CCTV tv and access control, ensuring that Murphy’s Law is well taken care of. With your items stored safely with them, you have your brand new visual closet right at your fingertips. Add items to your cart, then check them out and they could be home with you in as short as 4 hours. Drop offs are fast and efficient, as they’re running on the same time schedule as pick ups. Delivery is at a flat rate of $15 per trip no matter how many items you need returned. And if you’ve more to store, hand them over at the same time too! With free pick ups, super affordable pricing and the ease of retrieving your items anytime from just a tap off your smartphone, nothing gets swifter than storage like BEAM’s. With their cost effective and convenient storage system, BEAM is all about making life easier for you. For y’all loyal TSL fans looking to declutter your home, download the free app on the App Store or Google Play, use the promo code [TSLxBEAM] and enjoy free storage for your first month!